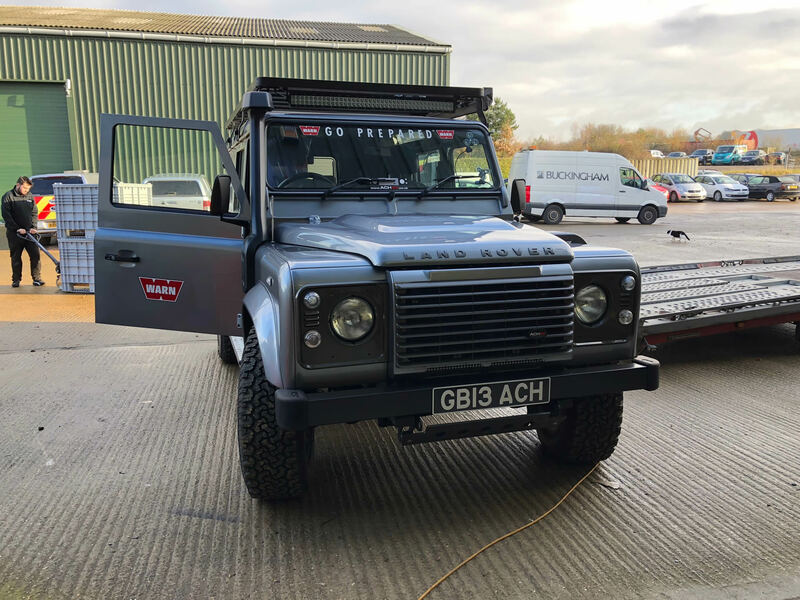 The two Land Rover Defender 110s, one with VB Air Suspension installed and one without, were started at the same point, and driven along the same piece of road at roughly the same speed. The measurements were then aligned using the distance travelled during the test. Subjectively, there was a big difference between the two vehicles, with the air-suspended vehicle providing a much smoother ride with much less body movement and noise, so it was interesting to see if this difference would be visible in the data. The obvious measurement to compare is the vertical acceleration, as this would show how the suspension coped with bumps and potholes in the road. Another useful measurement is the rate at which the vehicle pitches forwards and backwards, as this contributes strongly to the ride quality. The red lines represent the data captured in the standard vehicle, and the blue lines represent the air-suspended vehicle. 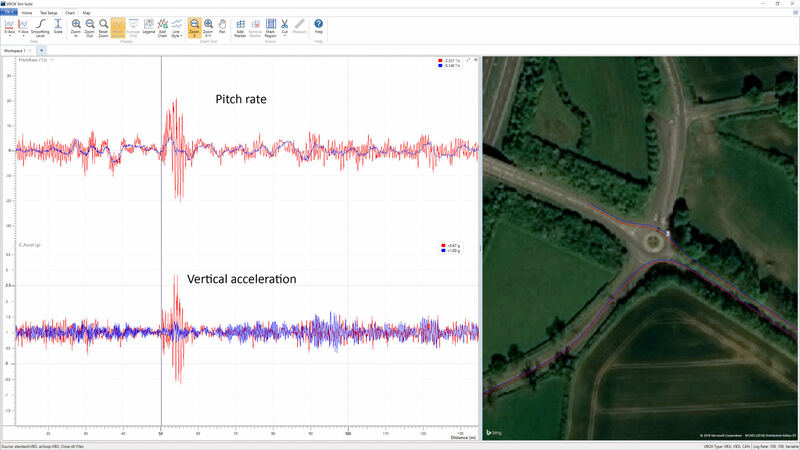 As you can see, the Pitch Rate in red from the standard vehicle shows a much larger peak value, almost 4 times the amount of the air-suspended vehicle. This pitching is also at a much higher frequency, which would correspond to much heavy vibration throughout the vehicle, and a strongly backwards and forwards rocking motion, which leads to a poor overall ride quality. The vertical acceleration also shows the same kind of behaviour, with twice as much amplitude in the standard vehicle compared with the vehicle with the modified suspension system. Whilst the subjective feel was very different between the two cars with the air-suspended vehicle feeling a lot smoother and less choppy, it was interesting to see this reflected in the data. 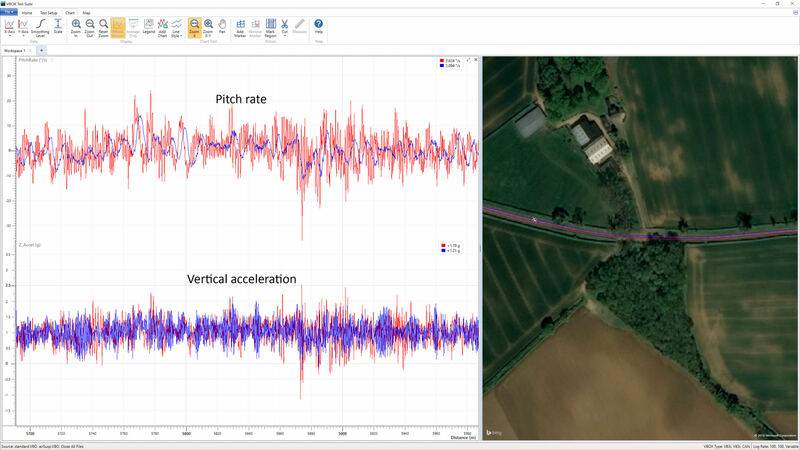 Examining all of the measurements taken using the IMU, where the most dramatic improvement was found was in the reduction of the frequency and amplitude of the pitching of the vehicle, often 4 times less than the standard vehicle.